U.S. halts permits for new nuclear power plants and renewals at existing reactors until waste issues are settled. 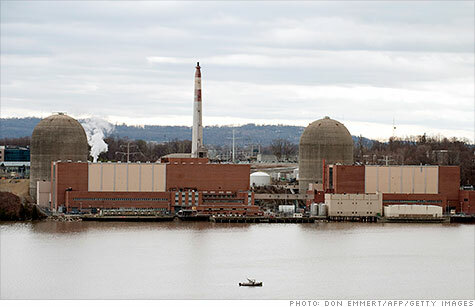 NEW YORK (CNNMoney) -- The U.S. government said it will stop issuing permits for new nuclear power plants and license extensions for existing facilities until it resolves issues around storing radioactive waste. The government's main watchdog, the Nuclear Regulatory Commission, believes that current storage plans are safe and achievable. But a federal court said that the NRC didn't detail what the environmental consequences would be if the agency is wrong. "We are now considering all available options for resolving the waste issue," the five-member NRC said in a ruling earlier this week. "But, in recognition of our duties under the law, we will not issue [reactor] licenses until the court's remand is appropriately addressed." There are 14 reactors awaiting license renewals at the NRC, and an additional 16 reactors awaiting permits for new construction. Ultimately, it'll be up to lawmakers to find a solution to long-term nuclear waste storage, but their track record on the issue hasn't been good. Nuclear waste disposal has been a daunting political question that is still unanswered after decades of study. But the NRC is expected to do more research around what would happen if a long-term waste storage facility isn't built. It will also conduct more research into the environmental impact if waste can't safely be stored on-site at nuclear plants, where it's currently stored. Related: How close are you to a nuclear power plant? Analysts feel the agency can conduct its research relatively quickly without having a major impact on nuclear plants currently seeking license extensions or utilities seeking permission to build new reactors. "We believe that the NRC will have sufficient time to complete its waste confidence and temporary storage fixes well ahead of license expirations," Christine Tezak, an analyst at ClearView Energy Partners, wrote in a research note Wednesday. But nuclear watchdog groups -- which don't agree with the NRC's assertion that the waste is currently safely stored -- are hoping the new review will provide an opportunity to push for stricter standards at nuclear power plants. There are currently 104 operating nuclear reactors at 64 plants across the country. Half are over 30 years old. '"The court is ordering them to do this analysis that should have been done a long time ago," said Edwin Lyman, a senior scientist at the Union of Concerned Scientists. "The more information there is, the more ammunition there is to make changes to the safety regulations." In particular, UCS and others want less of the waste to be stored in pools of water, which they believe are vulnerable to sudden draining and possible meltdown, and more of it to go into secured concrete bunkers known as dry-cask storage. Nuclear power provides the country with about 18% of its electricity. Renewables make up about 14%, with about half of that coming from hydroelectric dams. Most of the rest is split roughly evenly between natural gas and coal.